1kg packets of rice for 40p at LIDL!!!!!!! You can only buy 6 at a time. The box in the picture I have is a box of 10 packets inside. Some stores let you buy them and some store doesn't. I thin this offer has been on for this whole week. Might end tomorrow or whenever i don't know. REALLY HOT DEAL FOR RICE AT THIS PRICE! I think this is national as i have found it in 3 LIDL stores. Remember each customer can only get 6 each, depending on the stores. Bring family members to buy separately. Hot price, how about the taste...? 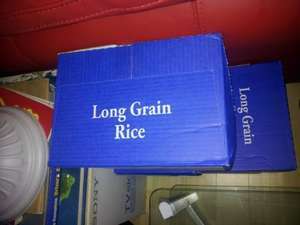 For those that don't have a Lidl nearby, Tesco is selling their Value range long grain rice for 40p for a 1kg bag too! sorry had to add some things so post was under thingy..
Asda sell their value rice for 40p a kilo too. Perfect for chili con carne etc. Looks like the Supermarkets are having a rice war without telling their customers! Deal posting newbie! This is vietcn first deal post. Help out by leaving a posting tip or just to show your appreciation for their contribution.